Welcome to my 6th contest. 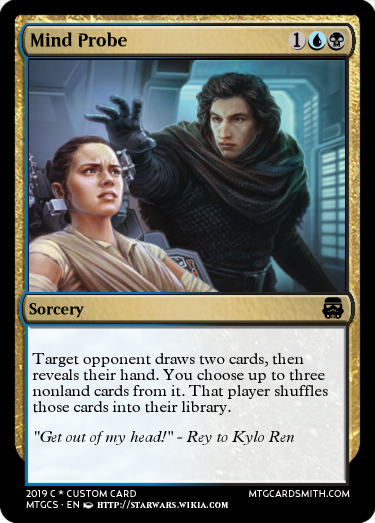 This contest is about the Star Wars Universe (obviously), and as such, you will be tasked with creating Star Wars themed cards. This contest will be broken down into several different categories that everyone will compete in (will be listed below). There will be prizes, and they awarded in each category. Now without further ado, lets get into the rules. *Cards submitted must match the Color specifications for the Category in session. *Only cards from or inspired by the Star Wars movies, games and books will be allowed. *The exception to the above rule is the Extended Universe Category. *Cards must include a Star Wars themed picture (pictures that are close or are an interpretive style of Star Wars will be accepted). With that out of the way, here is a list of the Categories that will be used. And finally, the prizes to be handed out in each Category. If you would like to suggest a color scheme and a faction that it would pertain to, please feel free to do so. As a clarifier, you do not get to choose a Category. I will choose the first Category, then when that Category's deadline is up, I will judge it and move on to the next Category. What's the first category? And why no ewoks? The colors are White, Blue and Red. @Bowler218. I can put the Ewoks in if you would like. What color should they be. Colors not used already with the categories already up would be preferred. And...what the heck, I'll throw Halo in there to. I think ewoks would be green. Alrighty, I'll add a mono-colored set of categories and put Ewoks in. Cool, ill bbl to drop entries. I think Ewoks would be white. They are small and shy. Green creatures are big and ferocious. In my opinion, I think it would be more fun if we were free to choose any colors for what we make. But it's your contest. I agree with Sith=UB though. @Revan, are artifacts such as vehicles allowed? Here, you go, been a while since ive been on the site, would someone post the link for knowing how to post cards, i totally forgot? @Tomigon, the first category is Old Republic White, Blue and Red. I can keep your submission for entry into the Sith category though. I was planning on doing it next. Oh sorry, I didn't read the rule carefully. That's alright, I expected a little misunderstanding of the rules. Alright, deadline is Jan 31st. Nice entry, but the current theme is Old Rebublic (White, Blue, Red). You can keep the entry for the Sith or Sith Empire categories if you want. @Revan oh ok sorry about that. I'll make something else. I expected some trip-ups with the rules. I can keep the card for the next category if you would like. 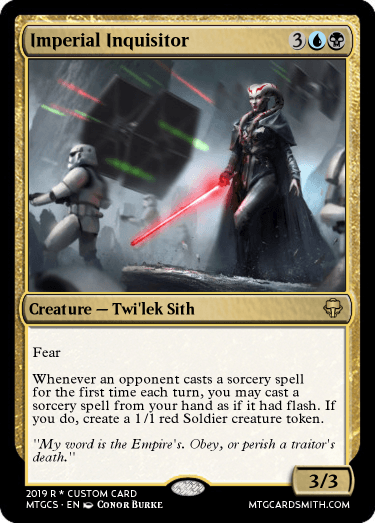 Revan, I have another card for the contest. 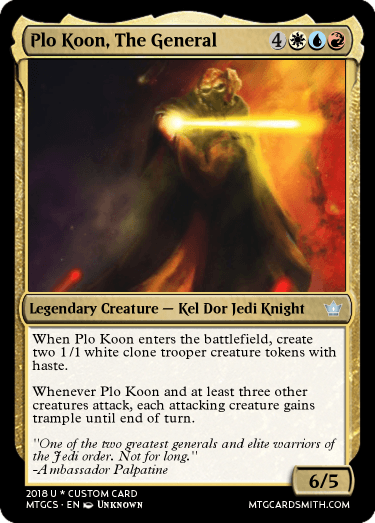 First Place is @bigbadbooknerd with Plo Koon, the General. Second Place is @ASubtleGhost Imperial Inquisitor. Third Place is @Tomigon with Mind Probe. 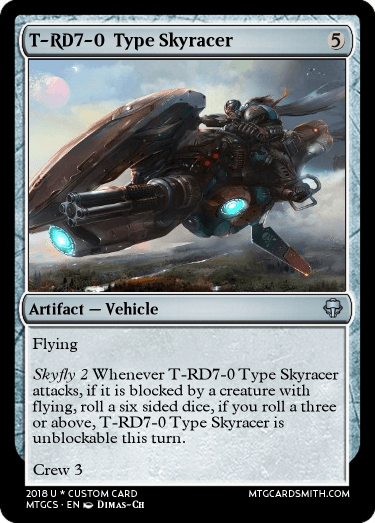 Best art is @bigbadbooknerd with T-RD7-0 Type Skyracer. Most Powerful is @IG-87 with The Sith Wars. Best Themed is @IG-87 with Old Republic Trooper. Most Creative is @IG-87 with Moment of Valor. 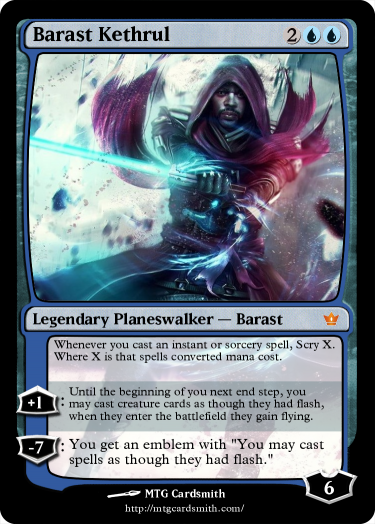 Revan's Pick is @bigbadbooknerd with Barast Kethrul. @bigbadbooknerd, you get 10 Faves! @ASubtleGhost, you get 4 Faves + Follow. @Tomigon, you get 3 Faves. @IG-87, you get 6 Faves. Next Category is Sith Empire. Thanks! Pick your favorite ten of my cards! I know Darth Bane (the center person in the second card) is more Early Modern Republic-era than Sith Empire-era, but I decided that the card overall fit here better. @SpellPiper2213, That's alright, as long as the card colors match up, I'm not to worried about the era of the Sith.